Redrock Micro’s DSLR Field Cinema Deluxe Bundle v2 brings a cinema production form factor to your video-capable DSLR. As impressive as modern still cameras are at producing pro-level video imagery, they can often be a challenge when shooting handheld video. That’s where the Field Cinema Deluxe Bundle comes in, providing you with a modular shoulder mounted system that includes follow focus, handgrips, DSLR plate, shoulder pad, counterbalance weights and quick-mounting rod clamps–all on a dual 15mm carbon-fiber-rod system that can be customized as needed. 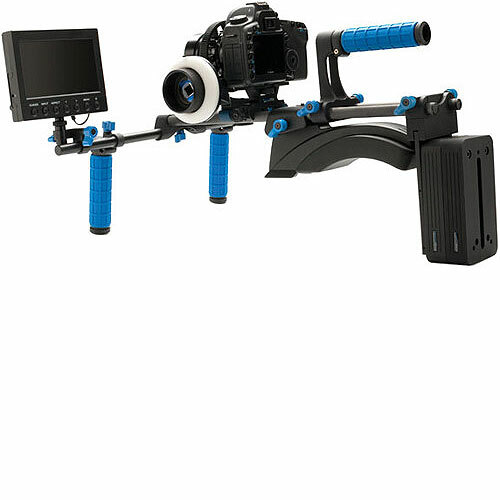 Redrockmicro Field Cinema Deluxe DSLR Rig V2 is available for rent or hire from RENTaCAM Sydney.